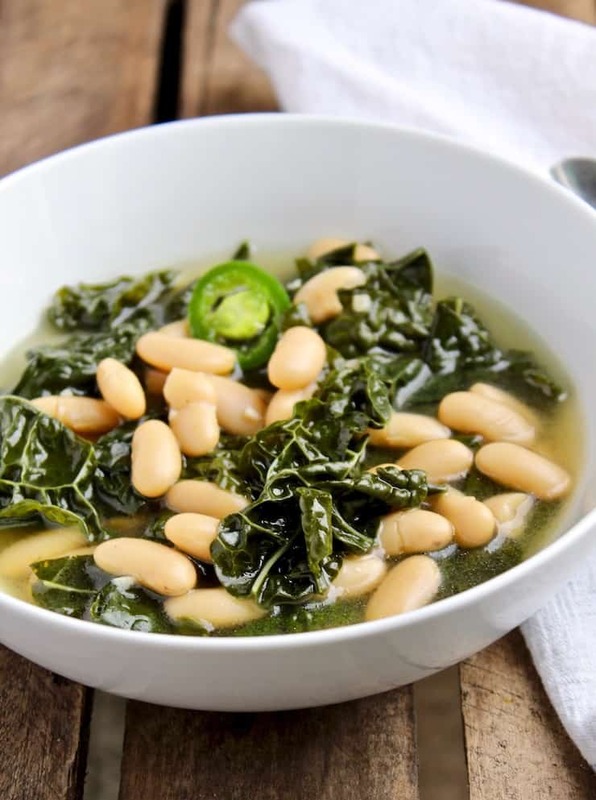 Kale and cannellini bean soup ~ simple, healthy and rustic soup, with Tuscan kale and white cannellini beans. 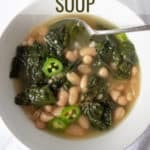 I first posted this Tuscan Kale and Cannellini Bean Soup about a year and a half ago, when I first started this blog. I still love it, just made it today, and decided to update the photos. Hope you try this soup, especially if you’ve been overindulging this time of year ~ it’s so good for you and a nice break from rich food. This has been my go-to soup lately. I’ve been making it a lot. I’m getting a bit tired of my doctor’s complaints about my cholesterol levels and am trying to get my numbers acceptable. This soup is just the ticket. Simple, healthy and hearty. It’s super easy to make with just a few ingredients. I love Lacinato kale, also known as Tuscan kale. It has a more mild taste to me than the curly variety which sometimes tastes bitter. But you can use whatever kind of kale you like. And I love the creaminess of cannellini beans, here they are bathed in olive oil and garlic. 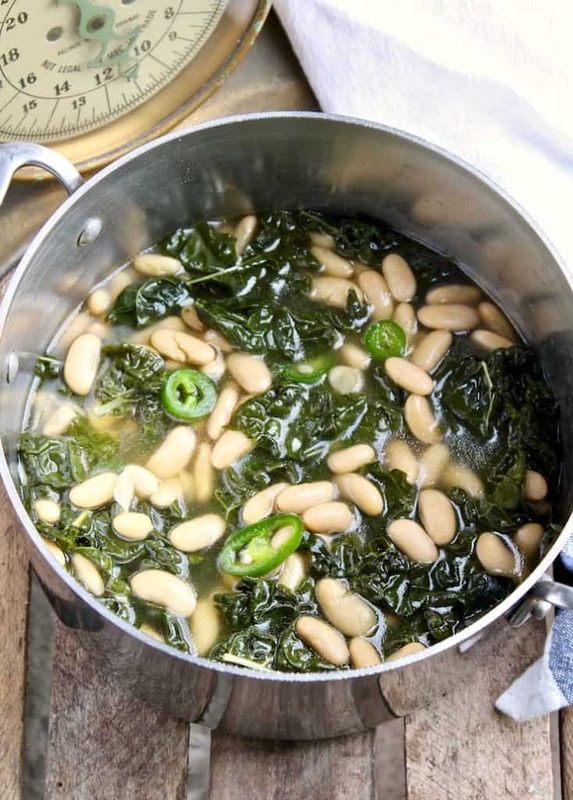 I use canned beans but go ahead and use dried if you like. I tend to go for a quicker preparation than soaking overnight and then cooking for a couple of hours. Whatever floats your boat. I highly recommend homemade chicken broth for this soup, with so few ingredients, it makes a huge difference in the taste. This soup is finished off with some heat from fresh chili pepper. My husband is a huge meat eater so I add some Italian sausage to his bowl, which is a great addition to this soup. Any type of sausage works, just use what you like. 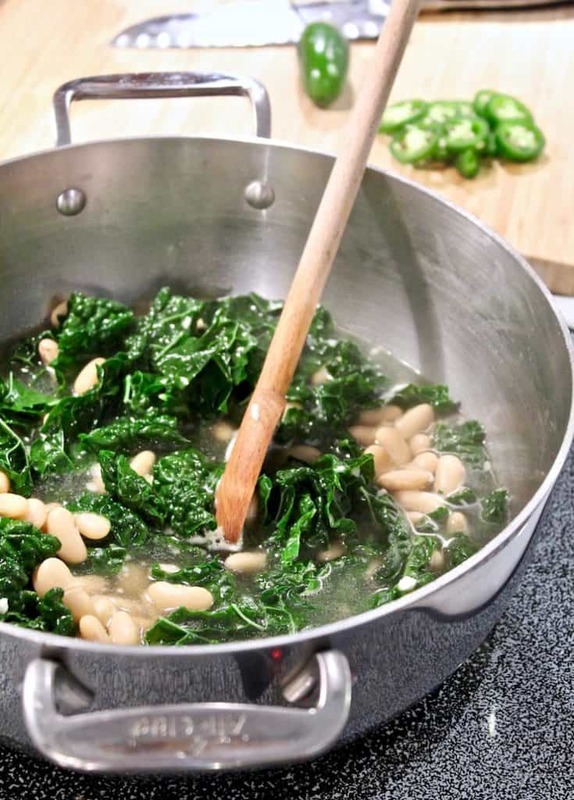 If you’ve tried this Kale and White Bean Soup, please rate it below in the comments and let me know how it went ~ I love hearing from you! HUNGRY FOR MORE? Subscribe to my Newsletter and come hang out with me on PINTEREST, INSTAGRAM and FACEBOOK for all the latest updates. 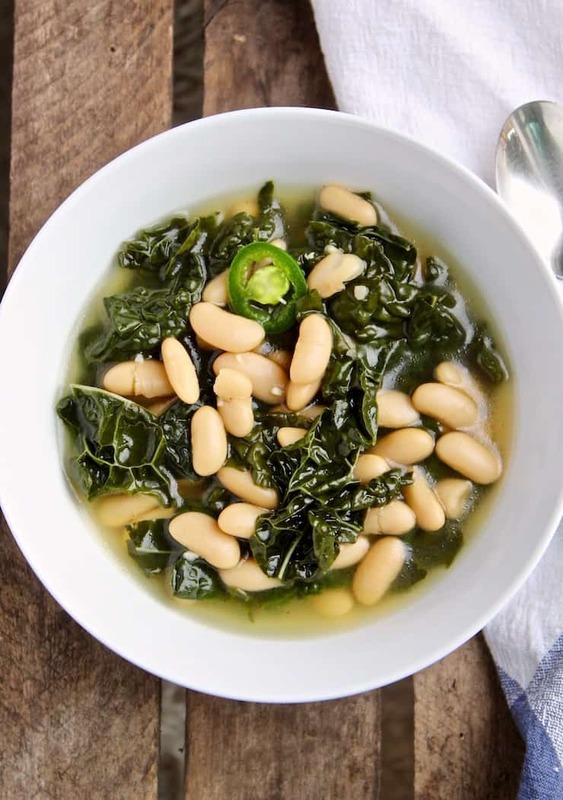 Simple, healthy and rustic soup, with Tuscan kale and white cannellini beans. Heat the olive oil and garlic in a large pot over medium heat until aromatic, about a minute or two. Careful not to burn the garlic. Add the beans and stir to coat with the oil and garlic. Add the chicken broth and kale and season with some salt. Cover the pot and simmer until kale is wilted and to your liking, about 15 minutes. Add the sliced serrano (or jalapeno) pepper and cook until heated through. Season to taste with more salt if needed. Stir in sliced sausage if using, or just add to the individual bowl. * I adapted this recipe from a newspaper clipping out of my messy recipe drawer. 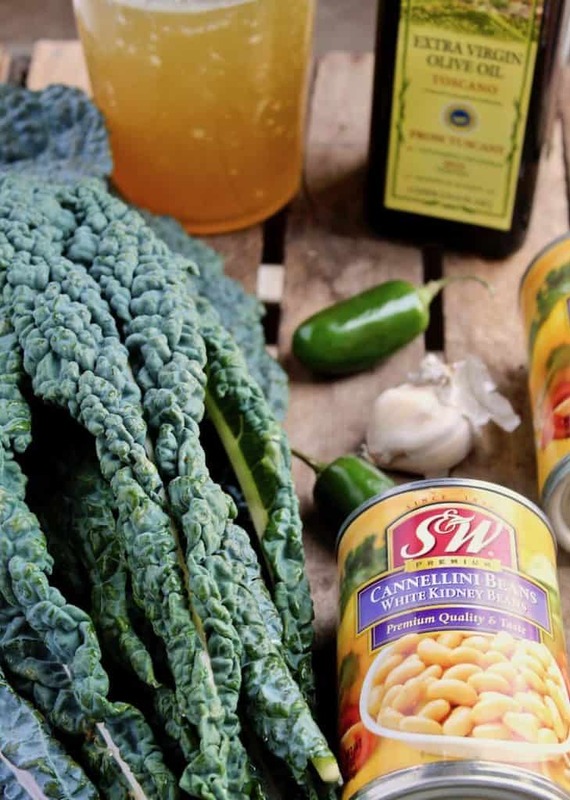 Cannellini Bean Soup… it sorta rolls off your tongue… and into your tummy!